Annapolis, Maryland is the capital of the State of Maryland and the county seat for Anne Arundel County. It is also home to the United States Naval Academy and St. John's College. It has many great restaurants and bars, and is home to the Ramshead Tavern, where some of the best musical acts in the world come to play. Annapolis has its own police force. Annapolis is located approximately 30 miles to the east of the District of Columbia and 25 miles south of Baltimore City. Leonard R. Stamm has represented individuals charged in Annapolis, Maryland with driving under the influence (DUI) and driving while impaired (DWI) by alcohol for almost 30 years. He is a former president of the Maryland Criminal Defense Attorneys' Association. He also the Dean of the National College for DUI Defense. (Click here to read and watch a video of his Dean's Address). 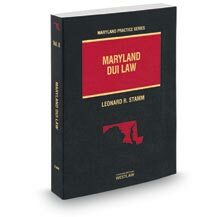 He is the author of West's Maryland DUI Law, the definitive treatise on Maryland drunk driving law. He is recognized by Super Lawyers, Best Lawyers, he is given the highest rating by Martindale-Hubbell, AV-Preeminent, and is rated "10-Superb" by Avvo. Drunk driving defense is one of the most complex areas of law, requiring extensive experience and expertise. The lawyer must carefully review all aspects of the State's case, from the basis for the stop, the officer's decision to require the driver to exit the car to perform standardized field sobriety tests, the administration and interpretation of standardized field sobriety tests, the advice of penalties for failing or refusing a chemical breath or blood test, and the administration of the test itself. It is unusual to see a case where there is not some defense available to beat or reduce the charges. In most cases, prosecutors offer plea deals that are no better than what would happen after losing a trial. So there is usually little downside to fighting the case in court. Unfortunately, most lawyers in Annapolis assume the case is too difficult to win in court or at the MVA and fail to challenge the State's case. Some lawyers never challenge the State's case. This can be a huge mistake since most DUI cases have issues that can be raised in defense, and with zero or very minimal penalty. In other words, the result of fighting and losing is rarely worse than just pleading guilty or not requesting a hearing at the MVA. So why would you want to choose a lawyer who will not fight your case? When interviewing a lawyer, you should ask if your lawyer intends to fight the case, and if not, why not. If you have been pulled over, stopped at a drinking and driving sobriety checkpoint, accused and/or charged with a DUI or DWI, failed a field sobriety test given by a police officer, given or refused a breathalyzer, or just have questions about fines and punishments that go along with DUI and DWI charges or other traffic or criminal related charges please contact Leonard R. Stamm for a free consultation. Leonard R. Stamm represents clients that have been pulled over for DUI or DWI or some form of drunk driving or driving while impaired charges by Maryland State Police, Anne Arundel County Police, Maryland Transportation Authority Police in Annapolis, Maryland. Be represented by the criminal lawyer who wrote the book on Maryland DUI Law, literally. If you need to be defended or represented for a drunk driving arrest in Annapolis, Maryland, call 301-345-0122 for a free consultation.